About a month and a half ago I discussed my position in the Scripps/Journal transaction that ended up closing on Wednesday (4/1/15), as a Scripps shareholder I was about 90% exposed to the eventual TV/radio broadcasting company (keeping the Scripps name and SSP ticker) and 10% exposed to the new newspaper publishing company Journal Media Group (JMG). From the SSP side pre-transaction, I ended up about ~34% but that was heavily weighted towards SSP; I sold the new SSP position post-closing as it's trading for roughly fair value at 8.5-9.0x a blended '15/'16 EBITDA. In contrast and classic small spinoff fashion, Journal Media Group was sold off indiscriminately yesterday - down over 10% on the day despite trading extremely cheaply based on EV/EBITDA and free cash flow metrics. To recap, Journal Media Group is a combination of the Milwaukee Journal Sentinel (formerly with Journal Communications) and Scripps' dozen or so smaller regional/community papers. 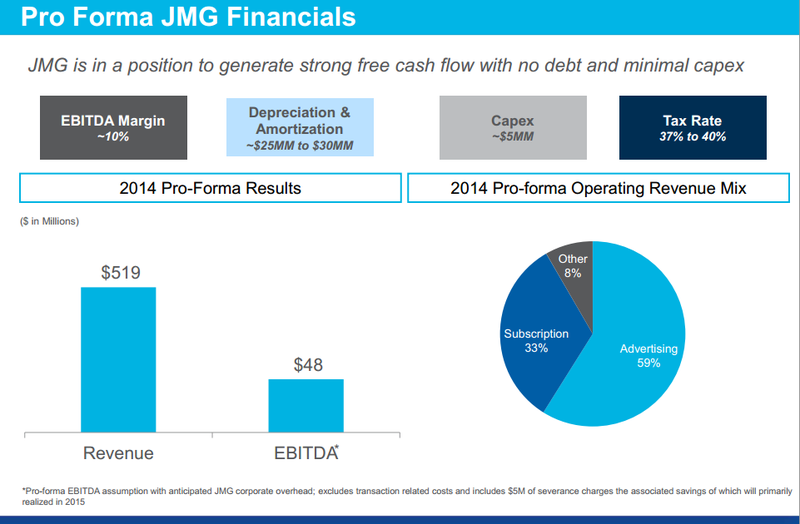 I know many don't like the EBITDA metric, so on a free cash flow basis JMG should generate roughly $1.40/share unlevered in free cash or ~18% FCF yield (check my math on that). New Media's valuation is a clear outlier, the market seems to be paying up for the Fortress sponsorship and capital allocation acumen. 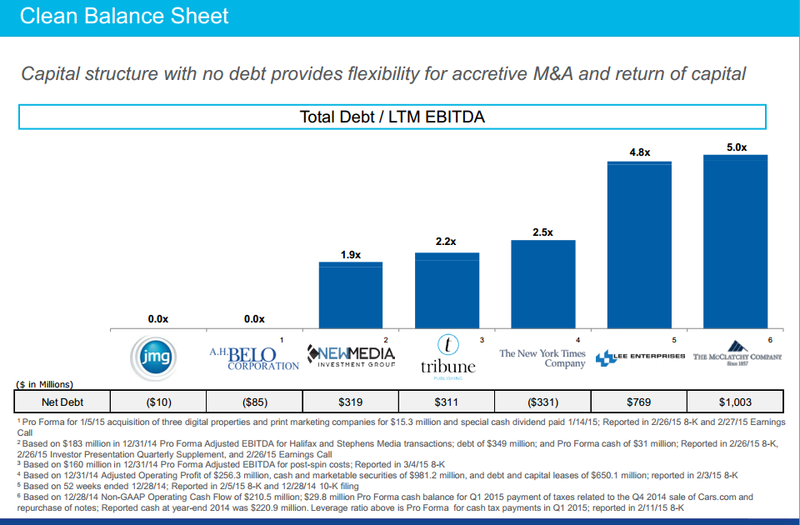 Given JMG's lack of debt, and former Scripps CFO in the CEO spot, I could see JMG pursuing a similar community paper acquisition strategy that would tuck in nicely with the ex-Scripps newspaper assets. It's just too cheap after the post-transaction dump to sell. A few weeks ago a reader brought to my attention a unique spinoff where a closed end fund, NexPoint Credit Strategies Fund (NHF), was spinning off an apartment REIT they had been building inside NHF, essentially they created a non-traded REIT and then floated it via a spinoff. 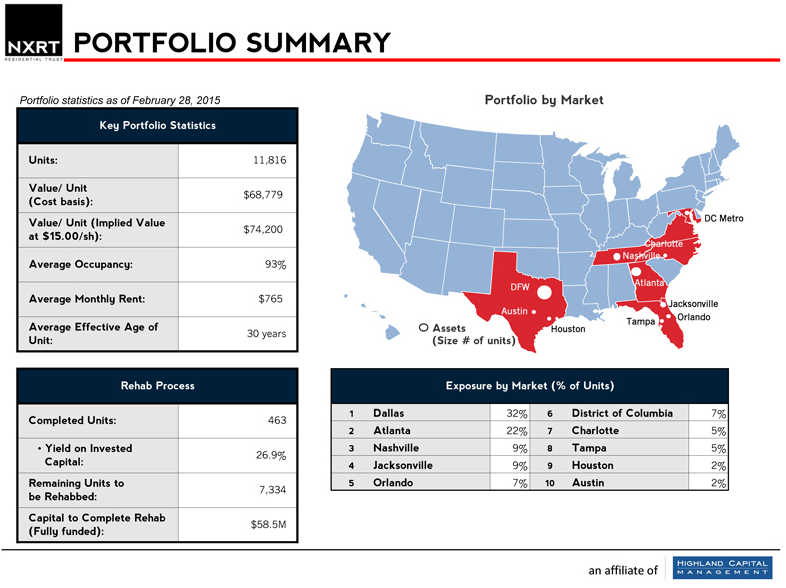 On Wednesday (4/1/15), the spinoff was completed and NexPoint Residential Trust (NXRT) began trading - a small cap, externally managed apartment REIT focusing on Class B & C properties primarily in Texas and the southeast. The REIT is managed by an affiliate of Highland Capital Management, a Dallas based alternative investment manager co-founded by Mark Okada who frequently appears on financial television and actually provides intelligent, sane commentary. NexPoint Residential's current portfolio includes 38 multi-family properties containing 11,816 apartment units, with concentration in strong growing markets like Atlanta and Dallas. The initial plan is to target class B & C properties and add value through rehab/redevelopment of the properties. Larger REITs typically focus on big class A trophy type assets as its more economical, moves the needle, makes for better investor presentation materials, and immediately adds to AFFO and other metrics that REIT investors direct their focus. Being small also has another advantage, NexPoint Residential will be able to build their asset base in small increments (not unlike GPT) and fish in ponds where the largest apartment REITs and other institutional investors are precluded from playing due to their size. They also point out that very few mid and lower priced apartments are being built in the current environment, anecdotally I can attest to that as shiny new apartment buildings are going up all around Chicago's near north and near west sides reminiscent of the mid-2000s. The feverish pace of class A building leaves that market susceptible to supply shocks in the next recession, whereas the limited new supply in the mid to lower markets should provide a little protection to NexPoint Residential. 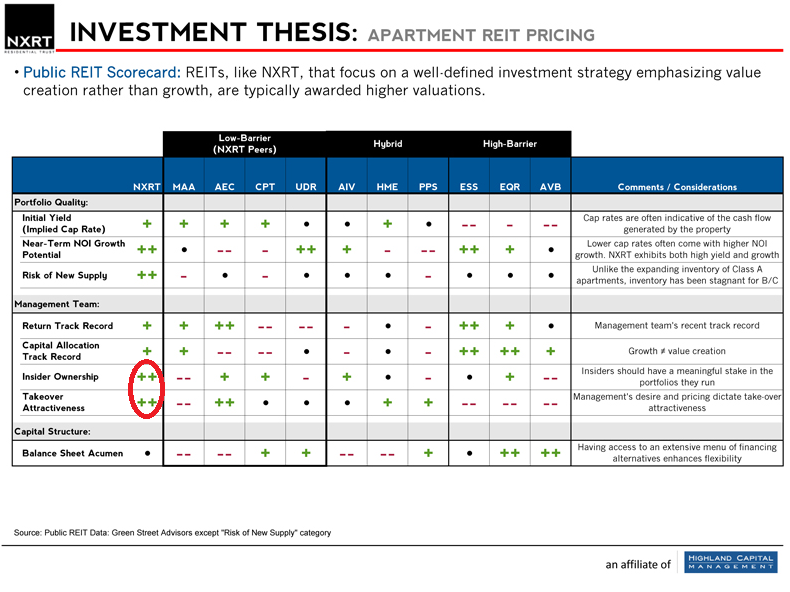 I found the below slide interesting from NexPoint Residential's investor presentation, obviously these kind of comparisons are cherry picked a bit, but two things stood out to me that you don't typically see in externally managed REITs: insider ownership, and a willingness to be taken over. Highland Capital (technically an affiliate) will earn a management fee/expense reimbursement amount capped at 1.5% annual of the assets, not the equity, so there's naturally a lean towards levering up the portfolio. The interesting part is there is no incentive payment and there's only a two year initial contract period that can be cancelled anytime after with 60 days notice, unlike others where the external entity is essentially tied permanently to their manager. That doesn't appear to be the case here and opens up the possibility of a takeover down the road which would likely be very accretive to the acquirer given NXRT's higher cap rates and ability to strip out the 1.5% management fees. Additionally, management has acquired 11.5% ownership of NexPoint Residential and indicated in their presentation they "will continue to be a natural buyer" and "management does not intend to sell shares or reduce its ownership stake", not typical statements you'd see in an externally managed vehicle that was just there to generate fat fees. NexPoint Residential is clearly smaller, more leveraged, focused on lower quality assets, and doesn't have the track record of its peers, but over the next year as the platform grows out and establishes itself in the market I'd expect the valuation gap to close. The bottom few like MAA, HME, PPS, and AEC are probably the best comparables for NXRT, at a 15x FFO multiple it's worth $16.80/share or 23% higher than yesterday's close. Not super exciting, especially in a potentially rising interest rate environment where cap rates could widen, but that also doesn't take into account asset and FFO growth which NXRT should be able to do in the next 12 months. A smaller opportunity might exist in NHF, the CEF parent to NXRT, after the spinoff NHF committed to maintaining its previous dividend, essentially hiking the dividend 38% given the smaller NAV base. NHF's strategy is to provide a credit hedge fund like offering with monthly dividend payments and liquidity, their performance despite the almost 2% management fee has been strong, yet it's hovered at a 10-12% discount to NAV for a few years (one reason they did the spinoff). Now that the yield is higher, and the spinoff has lifted some of the funds more illiquid assets from the portfolio, the discount to NAV should decline slightly. As of yesterday's close, its trading at a 12% discount to NAV with a 9.5% yield.